Evo Wingle Packages And Price 2017. Evo wingle packages and price in Pakistan 2017 all details are available on this page so read all given information and get details of this new evo offer.EVO devices replaced with a brand new Wingle device at nominal upgrade charges of just RS. 1500 and enjoy Wingle Connectivity at the price of EVO unlimited Packages so get this and enjoy fastest internet through this new device. Customer shall visit any PTCL OSS with his EVO USB device & request for a Wingle upgrade. Customer shall be required to pay Rs.1,500 for the upgrade. 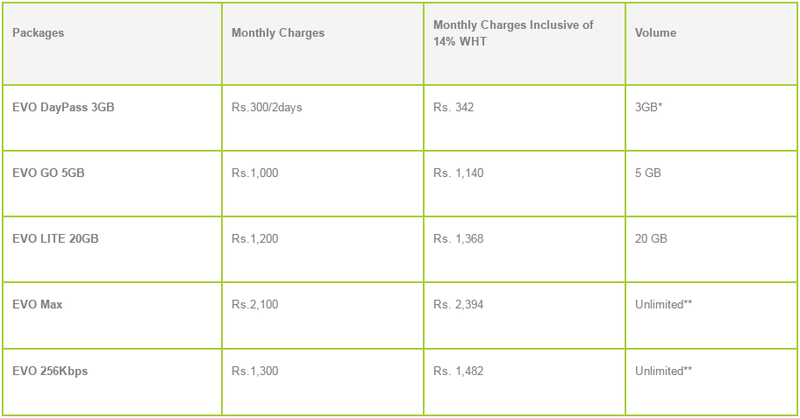 Monthly recurring charges for Wingle shall be Rs.2,000 which is the same as the monthly charges for EVO 3.1Mbps unlimited packages. OSS shall issue a new Wingle device to the customer upon receipt of payment. Device upgrade from EVO to Wingle at nominal charges of Just Rs.2000. Customer shall be able to enjoy Wingle connectivity at the price of EVO Unlimited monthly charges. Customer shall be required to make upfront payment for the upgrade in order to avail the offer. Customer shall be required to pay the Monthly charges upfront at the time of upgrade for both postpaid & prepaid billing; as the package upgrade shall be on Non-PSTN billing mode only. Offer is applicable for all EVO 3.1Mbps customers only.